This past weekend some friends were taking their children to university for the first time. It made me think about when my parents first drove away after moving me into my residence at Acadia University and that feeling of being so alone even though I was surrounded by crowds of people. Have you ever had that feeling of being alone despite the many people around you? I have a feeling one man in the Bible was used to feeling that way a lot of the time. Zacchaeus was a Jewish man, but he was a tax collector for Rome, collecting money from his own people for the despised Romans. Tax collectors were hated and viewed as traitors to their people for working for the Romans as they did. Not only that, but most tax collectors collected more money than they had to and kept the extra for themselves. As you can imagine, that didn't make them very popular. When Zacchaeus heard that Jesus was coming to Jericho, he "tried to get a look at Jesus, but he was too short to see over the crowd" (Luke 19:3). I can relate to that feeling, too! I have often been too short to see over people and have had to work my way closer to the front before I could get a look at what was going on. Considering Zacchaeus' profession, I doubt people were inclined to let him work his way past them. Unless I miss my guess, there were probably some who took great delight in making it harder for the hated tax collector. Zaccheaus, knowing he wouldn't otherwise see Jesus, "ran ahead and climbed a sycamore-fig tree beside the road" (v. 4). Today, if a grown man climbed a tree by the side of the road for a better view, he might get a few odd looks. In those days, though, it was thoroughly undignified for a grown man to climb a tree. For Zacchaeus to do so was a sign of how desperate he was to get a look at Jesus. He probably hoped no one would notice him perched among the leaves of the tree. Imagine his surprise, then, when Jesus stopped at the base of the tree, looked up at him and said, "Zacchaeus!...Quick, come down! I must be a guest in your home today" (v. 5). Swallowing his surprise, "Zacchaeus quickly climbed down and took Jesus to his house in great excitement and joy" (v. 6). It begs the question, why Zacchaeus? He was only one man in the crowd. There were so many people, remember, that Zachaeaus couldn't see Jesus just by standing on the side of the road. There were probably dozens of sinners in need of Jesus in that crowd, so why did He choose Zacchaeus that day? I see two possible reasons. First, maybe it was because Zacchaeus was actively looking for Jesus. Luke doesn't tell us why Zacchaeus was so determined to lay eyes on Jesus, but there's no doubt it was important to him. We don't know why the others in the crowd were there, either. Were some of them just tagging along with their friends? Were some of them Pharisees, keeping an eye on Jesus to see what He would do next? Were others only interested in this new celebrity that everyone was talking about? We'll never know, but maybe Zacchaeus was the one person most ready to accept Jesus, even if he didn't realize it as he was climbing up into that tree. The second possibility is that Jesus was making a point by choosing Zacchaeus. Though we don't know why the people in the crowd were there, we do know they weren't pleased by Jesus' decision to invite Himself to Zacchaeus' house: "He has gone to be the guest of a notorious sinner,” they grumbled" (v. 7). Remember, they hated Zacchaeus. They likely didn't think he was worthy of anyone's attention, let alone a popular teacher like Jesus. But, as Jesus pointed out, "the Son of Man came to seek and save those who are lost" (v. 10). Since the crowd labeled him a notorious sinner, Zacchaeus was probably one of the most obviously lost people in all of Jericho. By singling him out, Jesus was sending the message "no one is too lost for me." It wasn't the only time God sent that message. 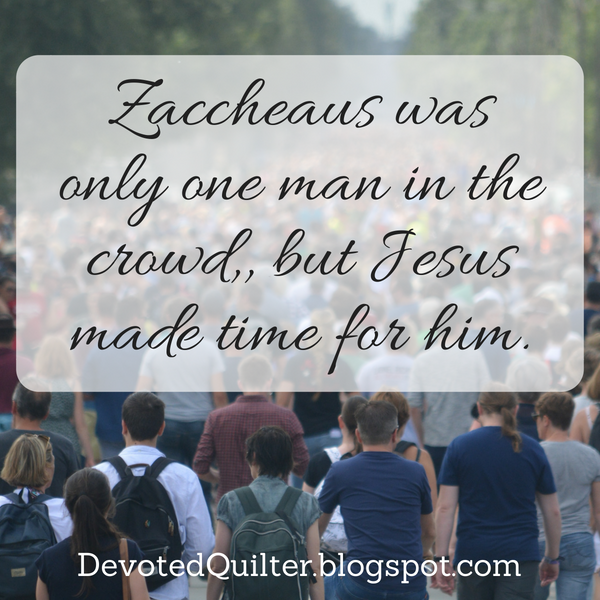 Though Zacchaeus was only one man in that crowd, Jesus saw him and made time to be with him. Something to think about next time you feel alone despite the people around you. Love, thank you for sharing.